This map is reproduced from Ordnance Survey material with the permission of Ordnance Survey on behalf of the Controller of Her Majesty's Stationery Office © Crown copyright 2005. Unauthorised reproduction infringes Crown copyright and may lead to prosecution or civil proceedings. Paibeil is a coastal district on the west side of North Uist, incorporating five townships - Paiblesgearraidh, Cnoc an Torrain, Baile Mòr, Cnoc a Lin and Caolas Phaibeil (Ordnance Survey 1878, Original Object Name Books, Inverness-shire, Book 6, 177; Beveridge 1911, 89). Both Paible and Paiblesgervy first appear in the documentary record in 1505, as ouncelands (Beveridge 1911, 89-90), but do not appear in Blaeu's Atlas of 1654 (Fig. H8.1), where the townships have slightly different names - Balmoir, Baldricym, Balchenghshs, Hasta, Knoklein, and Cheulas - although their relationships are similar. Few of the early maps record the level of detail in Blaeu's Atlas. A century later, Dorret's map is very similar, although he does not show Hasta, now Hasten. 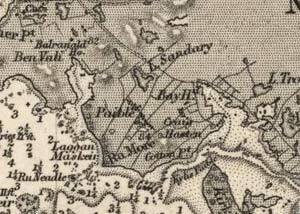 Kylis Pabbil first appears on Ainslie's map of 1789, but the only other place-name shown on this map is Ballymore. Both Pabilskerry and Kylispabbil are marked on Heather's map of 1804, while Thomson's map of 1820 confirms the existence of the five townships much as they appear today (Fig. H8.3). The north eastern boundary of Paibeil is defined by Loch Phaibeil, which appears on the maps of both Blaeu and Thomson, although it is not named as such until the revised Admiralty Chart of 1882. On Blaeu's map, it is depicted as a large loch, separated from the sea by a short length of winding river, with Balmoir to the east (Fig. H8.1). 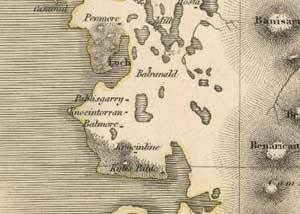 On Thomson's map, Loch Phaibeil appears as a large inlet extending in from the sea, lying to the east of Baile Raghnill (Balranald). This is illustrative of the later history of the loch; on Reid's 1799 plan, it is noted that Balranald had drained the loch, but the ditch, the Dig Mhór, was breached by a high tide, and the loch is now dry at low water, allowing salt marsh to develop around its fringes (NAS RHP1306; Ordnance Survey 1878, Original Object Name Books, Inverness-shire, Book 6, 158; Beveridge 1911, 188; MacAulay 1978, 8; Johnson, Cressey, Badger and Richardson 2005, 93-4; Fig. H8.2). The rock lying at the mouth of the loch illustrates this clearly; it is still known as Airigh Nighein Allein, 'the shieling of the daughters of Allan' (Ordnance Survey 1878, Original Object Name Books, Inverness-shire, Book 6, 165; Beveridge 1911, 71, n.1). The breaching of the Dig Mhór turned Loch Phaibeil into one of the few sheltered harbours on the west coast of Uist (M'Rae 1837, 161; Ordnance Survey 1878, Original Object Name Books, Inverness-shire, Book 6, 165). Although predominantly sandy and backed by dunes, the shoreline to either side is fronted by rocky headlands and shoals and is both accreting and eroding (Johnson, Cressey, Badger and Richardson 2005, 83-8, 93-8). Baile Raghnill, the farm now lying to the east of Beinn a' Bhaile, a knoll at the north west corner of Loch Phaibeil, was the seat of the MacDonald lordship of North Uist, until their loss of influence during the sixteenth century (ibid., 4, 50-1; MacRury 1950, 3). On Reid's 1799 plan, it is clear that the original house lay further inland, though the township was clustered around Beinn a' Bhaile, 'knoll of the settlement' (Moisley 1961, 90). During the feuds between the various MacDonald factions in the sixteenth century, their place of refuge was Dun Steingarry on the lands of Paiblesgearraidh, described as 'the little Inch of Lochpabill' in near contemporary sources (Beveridge 1911, 187-8; MacRury 1950, 4-5). The dun apparently lay at the south west corner of Loch Phaibeil, now on the north side of the Dig Mhór. However, there are no traces of any structure in this vicinity, although Bronze Age pottery has been recovered from a midden just to the west (NMRS no. NF76NW 2, NF 7198 6838 (dun); NMRS no. NF76NW 9, centred on NF 7161 6823 (midden)). A well, identified by Beveridge as Tobar Steinagarry, lies just to the west again; this is the only well in the area, but no traditions are associated with it locally and today it is known as Fuaran Hanglam, taking its name from a nearby rock (NMRS no. NF76NW 3, NF 7143 6813). During more recent coastal surveys, Fuaran Hanglam was not identified, although further features - including two cremation deposits (one overlain by white quartz pebbles and within a cist), a cist containing a wooden artefact, a hut-circle, another possible hut-circle, two structures of uncertain date, pottery and worked bone (as well as other animal bone and a deer skull from within a layer of peat) and a slipway, have been discovered in the same area (Johnson, Cressey, Badger and Richardson 2005, 99, 222-223, Sites 434-443). Some of these features are contained in the peat exposed at the entrance to Loch Phaibeil and there appears to be the potential here to establish a detailed palaeoenvironmental chronology (ibid., 165). An eroding shell midden has also been recorded on Rubha Port Scolpaig (ibid., 83, 91, 221, Site 432). Beveridge identifies another possible dun at Cuithe Lianaclett, on the lands of Paiblesgearraidh and close to the eastern shore of Loch Phaibeil (Beveridge 1911, 188-9; NMRS no. NF76NW 6, NF 7260 6876). There are other possible duns in Loch Sanndaraigh, to the east of Loch Phaibeil, and another on a knoll, called Eilean Dubh by Beveridge, close to the Baile Raghnill steading (Beveridge 1911, 188-9). Finally a souterrain to the east of Baile Raghnill was partially dug out in 1896, but cannot now be located (ibid., 116; NMRS no. NF76NW 5, NF c.729 697). 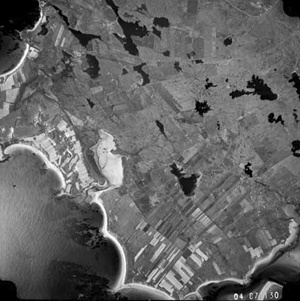 Field walls and buildings of relatively recent date are visible along the north and east shores of Loch Phaibeil (Johnson, Cressey, Badger and Richardson 2005, 99, Sites 445-450), while a further concentration of probable post-medieval agricultural features extends around Caolas Phaibeil (ibid., 99-101, 224-227, Sites 452-494). Amongst the latter, some of the field boundaries and the single midden could, however, be of much earlier date, hinting at the density and long history of occupation in this area. This area of North Uist is dominated by low-lying machair underlain by Lewisian gneiss. Though the nature of this landscape has dramatically changed over the last few centuries, much of the area of Paibeil and Baile Raghnill is still very marshy - and the importance of knolls and other areas of higher ground, however small, is clearly indicated by the place-names. Just to the north of Baile Raghnill is Sidhean Tuath. While this has been more recently identified as a burnt mound, it was thought by Beveridge to be a dun and its name indicates that it may have been of significance in the Early Medieval period (Beveridge 1911, 190; NMRS no. NF77SW 6, NF 7193 7017; tuath could just mean 'north'). Another knoll, Cnoc a' Bhodaich, the 'Old Man's Hill', in Paiblesgearraidh was believed to be the burial place of twelve Viking raiders, killed by a single old man (MacAulay 1978, 6). Traditionally, the Norse, in the days of Lochlann, were accustomed to find a safe haven for their galleys in the hollow now occupied by the tiny Loch Hasten, to the north west of Craig Hasten; the whole of the surrounding area - the machair lands of Cnoc a Lin and Baile Mòr - supposedly lay under the sea (MacRury 1950, 1; MacAulay 1978, 4-5). We, the wadsetters tacksmen, and possessors undersubscrivers attest and deliver-That in regarde of the extreme poverty reigning amongst the haill tennants and possessors within the Barony of North Uist occasioned by a murain in our cattle first in 1717 but more especially this year by a second murrain whereby a great many of our cattle have perished to the number of seven hundred and fourtie five cows, five hundred and seventy three horse, eight hundred and twentie sheep. . . . And moreover we attest and deliver that about Candlemass last the sea overflowed severall parts of the countrie breaking down many houses to the hazard of some lives which hase impaired the lands to such a degree as its possible it may happen more and more that they cannot answer to the worst sett in former times (Attestation by the Gentlemen of North Uist, 1721, quoted in MacDonald and MacDonald 1904, 664). Judicial Rental of Sir Donald MacDonald's Estate of North Uist. 1718. John McDonald 11m. 3sh. 4d 1½ b. vict. 1 st. b.
John Mcinish vic ewn do. do. Donald McDonald 7½m 1 b. vict. 12 lb. b.
Donald Oig Mcillvory do. do. John McDonald 100 m 15 b. vict. 10 st. b.
Rorie McDonald 18 m. 10d 2½ b. vict. 1¾ st. b.
Donald McVaich £20 Scots 4 b. vict. 3 st. b.
Archibald McLellan 15 m 2 b. vict. 1 st. 8 lbs. b.
Annable McEan vic illimartin do. do. Donald McDonald £100 Scots 15 b. vict. 10 st. b. Vacant 120 m 12 b. vict. 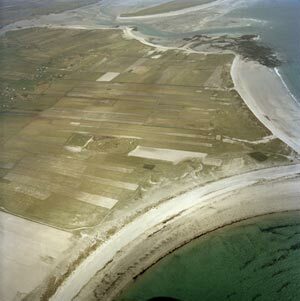 10 st. b.
Paiblesgearraidh was apparently 'outlying moorland used as a summer grazing place for cattle [but] is now one of the most fertile stretches of land in North Uist as a result of the ingenuity exercised by successive tacksmen' (MacRury 1950, 12). The existence of place-names such as Loch Sanndaraigh, 'loch of the sand shieling', to the east of Paiblesgearraidh, alongside Airigh Nighein Allein, does appear to confirm this pattern of development. The importance of cattle in the early modern economy of the Western Isles is reflected in the number of cattlefolds on the improved ground, many of which are apparent as square enclosures on more recent editions of the OS map and which also appear in the aerial photograph above (Fig. H8.4). In contrast, the common grazings of the crofters of Cnoc a Lin, Baile Mòr, and Cnoc an Torrain apparently lay on the south side of Loch Eford (Euphort) (Beveridge 1911, xiv), a considerable distance to the south east. Integral to the resources of the townships were also the offshore rocks, such as Causamul and its neighbours, which provided seals, the communal culling of which is mentioned as far back as the early seventeenth century (Anon. c.1630, 181; MacQueen 1793, 322; M'Rae 1837, 164). 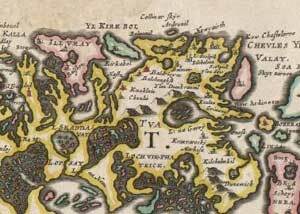 There are a number of place-names on the lands of Paibeil and Baile Raghnill whose significance is uncertain. To the north-east of Loch Phaibeil is Loch Runabhat, the 'loch of the counsellor', of Norse derivation, while to the north west is Aird an Rùnair, the 'point of the secretary' (Beveridge 1911, 46, 109; the Name Book gives the derivation of Loch Runabhat as the Gaelic 'loch of the plain' (Ordnance Survey 1878, Original Object Name Books, Inverness-shire, Book 6, 159)). These both lie on the lands of Baile Raghnill, as does Loch na Cille, loch of the church, which lies to the north of Loch Phaibeil. Beveridge's belief that Loch na Cille could not represent an actual church site, given its proximity to the parish church of Kilmuir at Hogha Gearraidh (Houghary), c. 1.5km to the north and just east of Aird an Rùnair, may not be correct, but there is nothing further to substantiate a church or chapel in this location (ibid., 295; see below). In the Name Book, it is given as 'loch of the burying-place' (Ordnance Survey 1878, Original Object Name Books, Inverness-shire, Book 6, 157). The name Creag a' Cheloir, the 'rock of the Superior', which is now surrounded by the Paiblesgearraidh cattle-fold, is said locally to be 'an indication of the fact that an important ecclesiastical centre was in the neighbourhood' (MacRury 1950, 12). The Balchenghsh of Blaeu's Atlas, does not appear to be Baile-eaglais, township of the church, but Baile-chinn-dheas, the 'hamlet of the south side', referring to the southern part of Paibeil district (MacRury 1950, 12; this seems more likely than Beveridge's belief that it was Seanaval, presumable Beinn a' Bhaile, on Baile Raghnill lands (1911, 49) and the OPS's association of the name with the parish church of Kilmuir (OPS, 373)). However, there is said to have been a chapel near to Tobar na Trionaid in Cnoc a Lin, from which Paibeil became known as Sgìr a' Phàb, 'the Catholic parish' (MacAulay 1978, 1-2). Although the present parish church (along with the Free and the Free Presbyterian churches) is now located in Paibeil, the foundation for this belief is unclear, particularly since the earlier parish church of Kilmuir lies on the lands of Baile Raghnill. Craig Hasten, a castle-like knoll to the south of Baile Mòr, is noted as the abode of fairies, and as an open-air preaching site, both before and after the Disruption of 1843 (MacRury 1950, 33, 35), but there are no hints of any earlier religious significance attached to this site. THERE is a Stone in form of a Cross in the Row, opposite to St. Maries Church about 5 foot high, the Natives call it the water Cross, for the antient Inhabitants had a Custom of erecting this sort of Cross to procure rain, and when they had got enough they laid it flat on the ground, but this custom is now disused (1703 (2003), 59). This cross cannot now be located, but may have been situated on the south west side of the peninsular, near Loch Roe (NMRS no. NF67SE 1, centred NF 6900 7050). Ordnance Survey, 1878 (1879). Inverness-shire. First edition. 1:2,500. Sheets XXXIII.11, 12, 16. Ordnance Survey, 1878 (1881). Inverness-shire. First edition. 1:10,560. Sheets XXXIII; XXXIV; XXXVIII. Ordnance Survey, 1901 (1904). Inverness-shire. Second edition. 1:2,500. Sheets 33.3, 4, 7, 8, 11, 12, 16; 34.9, 13; 38.4. Ordnance Survey, 1901 (1904). Inverness-shire. Second edition. 1:10,560. Sheets 33; 34; 38; 39. Ordnance Survey, 1967 (1971-2). 1:10,000 series. Sheets NF76NW; NF76NE; NF77SW. Ordnance Survey, 2003. 1:25,000. Explorer 455 (North Uist & Berneray/Uibhist a Tuath agus Beàrnaraigh). Edition A. Ordnance Survey, 1878. Original Object Name Books. Inverness-shire, North Uist. Book 6. NAS RH4/23/107. Institute of Geological Sciences, 1981. 1:100,000. The Outer Hebrides. Uist and Barra North. Solid Edition. Soil Survey of Scotland. , 1982. 1:250,000. Sheet 2. The Outer Hebrides. Soil. The Macaulay Institute for Soil Research Aberdeen. Soil Survey of Scotland. , 1983. 1:250,000. Sheet 2. The Outer Hebrides. Land Capability for Agriculture. The Macaulay Institute for Soil Research Aberdeen. Soil Survey, The area of present settlement is class 4/2. The areas along the coast to the north west and south east of Loch Paibeil are class 5/1 and 5/2, while the area to the north of Loch Paibeil is class 5/3. Once more it is difficult to make an assessment of an area which has been so subject to shifting sand, inundations and changes in coastline. But clearly this was an important area of settlement indicated by Balranald and the former existence of a Husabost (ON hus-bólsta∂r = farm with a house, presumably of some importance). The remarkable crop-growing quality of the machair doubtless accounts for this, which is also a feature of the other Paibles in the Western Isles. The ecclesiastical stamp is here also, for there is evidence of several former churches, and also early Christian sculpture round about in North Uist (Fig.Intro.2). The strategic nature of this location is not, however, as obvious as with several of the other sites discussed.